Call or email us for any questions you may have about our many services. The grass is always greener for those who use Longhofer Lawn and Tree Care. For 45 years, we have been helping Wichita area residents and business owners enhance the look and value of their property with our quality lawn, tree, and shrub care services. We are locally owned and operated, and we pride ourselves on providing only the best products and professional services to ensure complete customer satisfaction. 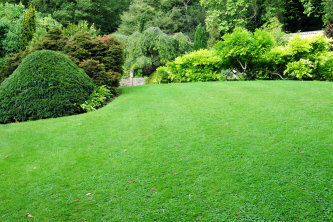 Our team of professionals has a combined total of 100+ years of experience in the lawn and tree care industry. These full-time, year-round, certified lawn and tree care specialists receive continuous education on the industry’s latest and greatest materials and application techniques. Each year, we incorporate the newest advancements into our service offerings to give our customers and their lawns the greatest advantage. Not only are our services priced competitively, we also guarantee that you’ll be pleased with the results. Call us today at (316) 267-9173 or fill out the form on the right side of your screen for a free, no obligation analysis and quote.